or the Clock Master makes ominous pronouncements surrounded by heavy-handed symbols of time and its ruinousness. I don't get nearly the sense of danger in the Bengali version that seems to haunt the Hindi one, which results in a corresponding lack in commentary on the decline of feudal society and all that juicy stuff that's in films like Jalsaghar. The debauched men don't seem as horrible, Chhoti Bahu's instant alcoholism doesn't seem as tragic, and Bhutnath has little personality at all. I'm often happy not to be hammered by histrionics, but if any story calls for them, surely it's this one. 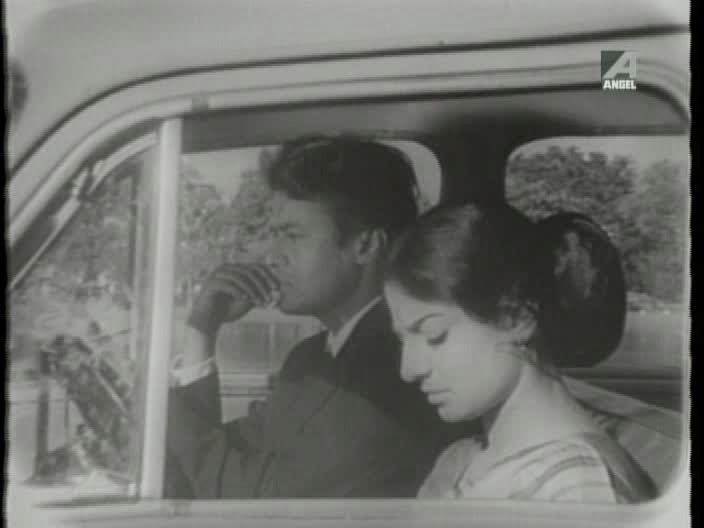 Amrita and I have discussed at length how Uttam Kumar's tendency to play things calmly and quietly works so well to balance out more dramatic expressions by people like Suchitra Sen, but in this film, nobody cranks it up, and the whole thing feels a bit limp and unimportant despite its beautiful, grandiose surroundings. Saheb Bibi Golam is on the Angel youtube channel if you want to see for yourself. And according to this recent story in ToI, there will soon be a new contemporary Bengali adaptation of the story. 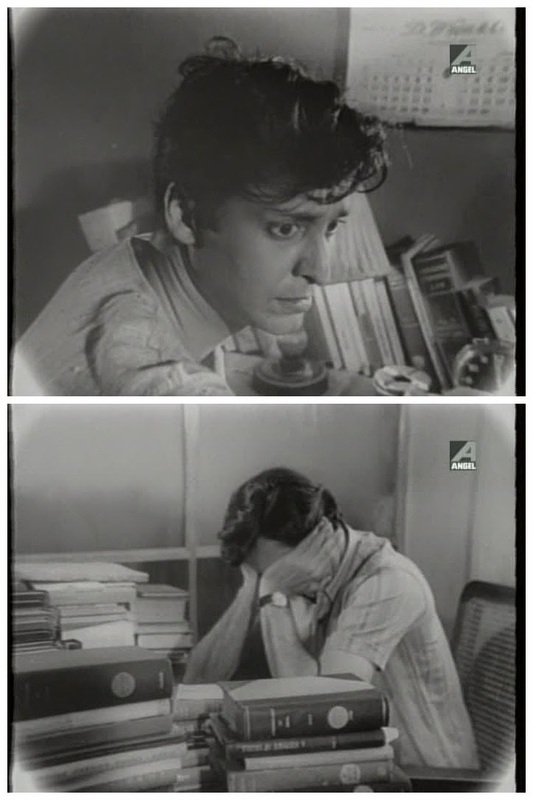 If there's one thing I've learned from Bengali movies, it's very risky to fall in love with young Soumitra Chatterjee unless you're very sure you're in a film that is at least part comedy. 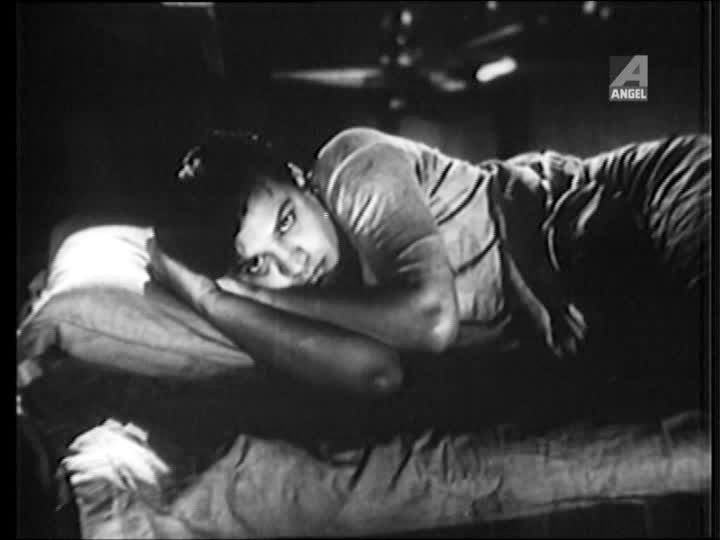 Apur Sansar, Khudito Pashan, Devi, "Samapti" in Teen Kanya, Charulata, Kapurush, Saat Pake Bandha, Jora Dighir Chowdhury Paribar, Baghini, and Teen Bhubaner Pare (which released just one year before this and which I also wanted to rewatch last week but my DVD isn't working * sob *)...it doesn't go well. I actually love this about his dramatic roles, these movies that show that love and/or marriage aren't easy and that, regardless of what your parents or society at large say, it may be helpful to know someone for more than a few weeks before you marry them. Plus these stories set up many opportunities for him to look pensive or sad, for which I am America's biggest sucker. This film has a lot in common with Saat Pake Bandha and Teen Bhubaner Pare: a young couple marries for love despite the disapproval of at least one parent, economic and/or family pressures set in, and things start to crumble. 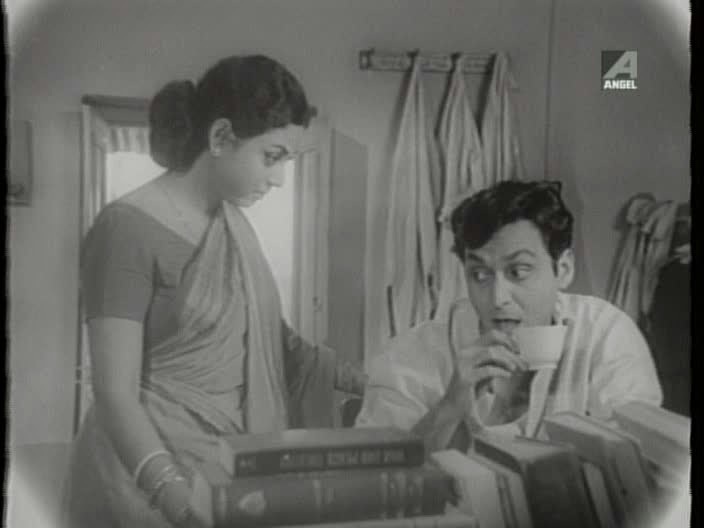 After a truly cute meet-cute in a library and elevator, Shukanto (Soumitra) and Kalkoli (Tanuja) get married over the very specific objections of her parents, who want her to marry the wealthier Boren (Subhendu Chatterjee) and cut off contact with her once she marries Shukanto. They move into Shukanto's room in his family's home, where his horrible mother instantly makes them both feel like dirt about expenses and Kalkoli caves to pressure to get a job; unfortunately that job is working in Boren's company, and rumors begin to arise. I have no idea why Kalkoli is so unwilling to get a job (there is no talk of them having children or of her taking on many duties in the house along with the three other adult women in this joint family); even before their marriage, she can't hold Shukanto's gaze when makes comments about how they'll be able to get their own flat since they'll both be working. 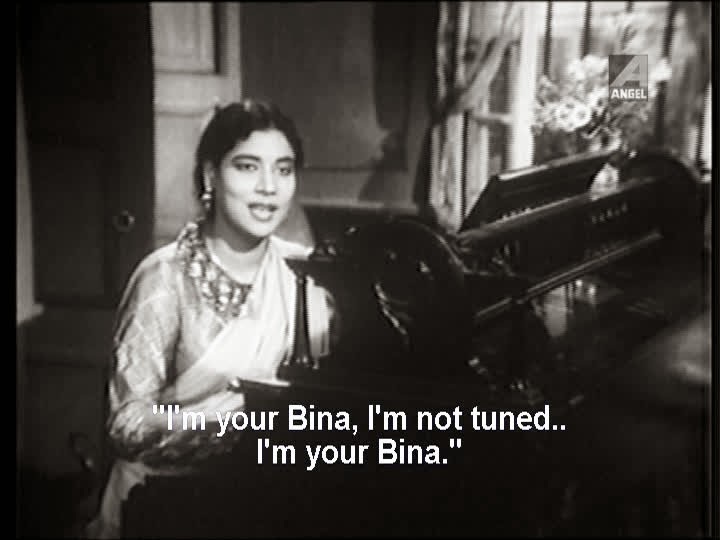 Like Suchitra Sen's character in Saat Pake Bandha, she is completely unafraid to express her opinions and needs; also like that character, this puts her in direct conflict with the people who presumably hold more power over her situation than she does herself (her husband and mother-in-law). The way the finale of Pratham Kadam Phool puts a teensy little Band-Aid on this conflict is a massive cop-out, and you just know that these two people are in for more clashes and strife. What makes this film special is its matter-of-factness about everyday life. 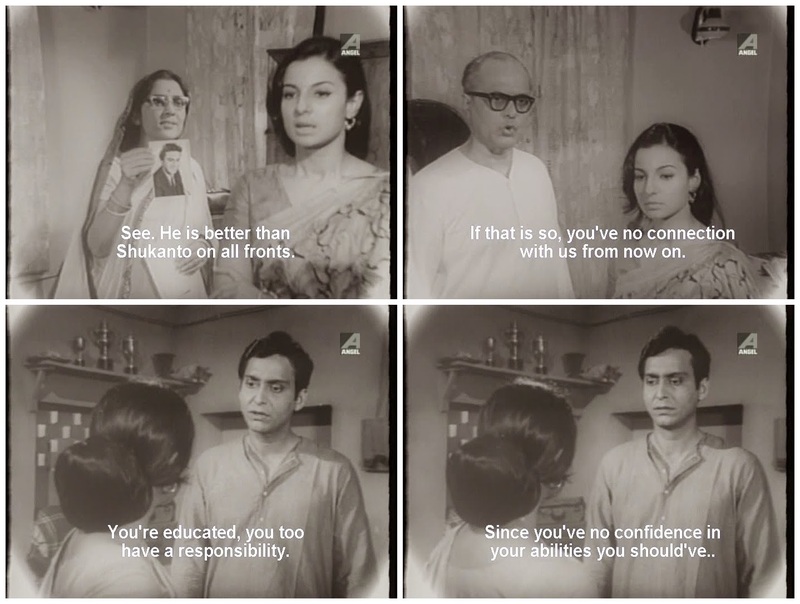 I should read up on what was happening in Calcutta in the late 60s, but based on this movie, I'd guess it's a lot of tumult over women working outside the home, the resulting changes to structures and expectations in joint families, layoffs, and a shortage of jobs even for people with university degrees. (I'm thinking of Ray's earlier Mahanagar and later Calcutta Trilogy.) In addition to these big-picture changes causing characters to bump up against each other, there are little squabbles over meals, shopping, mending, and commuting that make these characters relatable. There's also a surprising intimacy between the newlyweds when they're finally behind the door of their own room (no, not like that), finding joy in each other's company and in their little team having made it through another day. The problems here seem (I say "seem" because SUBTITLES) to result from people not going far enough in their conversations. I often want to yell "USE YOUR WORDS!" at movies, and in this case I think there is neither much attempt by anyone to explain why they take whatever position they're entrenched in nor to imagine (or ask about) the other person's perspective. There is no empathy, and sympathy quickly drains away too. 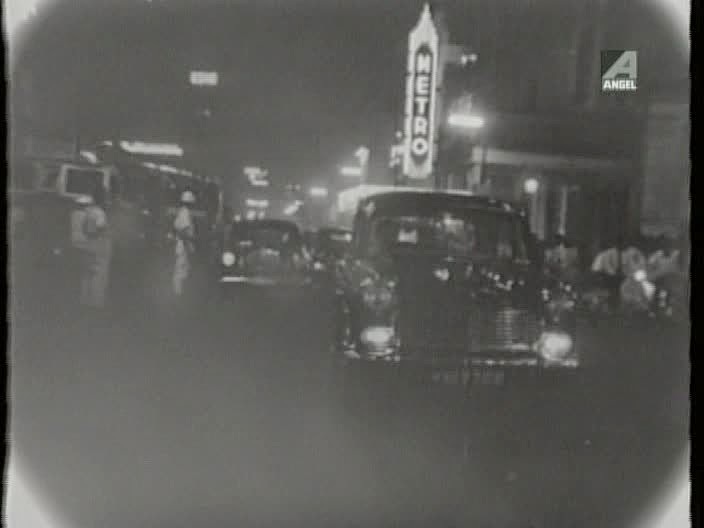 And I know you like pictures of old Calcutta. Thank goodness for this Goodreads summary and discussion of the Sarat Chandra Chatterjee novel on which the film is based. Poor video quality and no subtitles mean I wouldn't have stood a chance otherwise. I have much dislike for Parineeta and Devdas, and I'm not sure I would have watched this film had I known who was responsible for the story before I began. Datta is one of Suchtira Sen's last films, and she's as strong as ever in yet another romantic pair separated by religion and money. 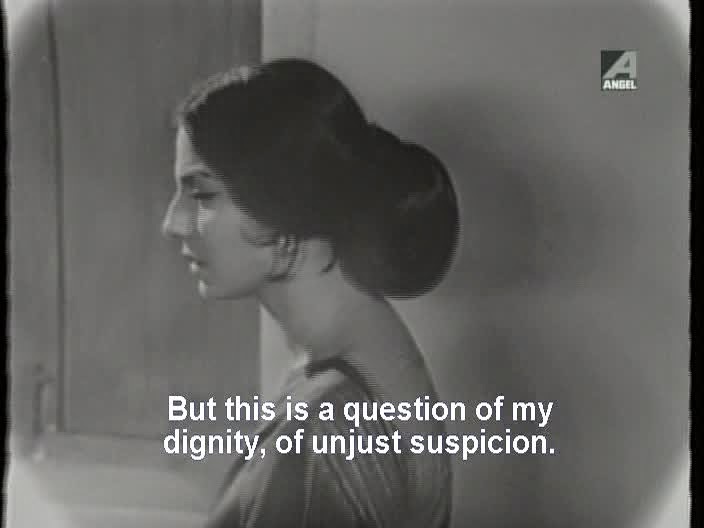 But to be honest, I stuck with this film through my ignorance only because I wanted to see this iteration of Suchitra-Soumitra, especially once I realized she is the instigator in their flirtations (see the ol' "get him teach you how to use the microscope" ruse below). Her saris and eyeliner don't hurt (Egyptian mural look ahoy!). And then Soumitra, who had been wearing his usual dhoti-kurta, walks in in a western three-piece suit and hat and my brain exploded. Isn't it interesting that we expect certain performers to look a certain way even though we know full well that their clothes are costumes given to them by other people and, ideally, dictated by the particulars of the story they're in? Even though I've seen Shashi Kapoor in person in very different clothes, in my head he's forever wearing some kind of colorful or patterned button-down shirt. 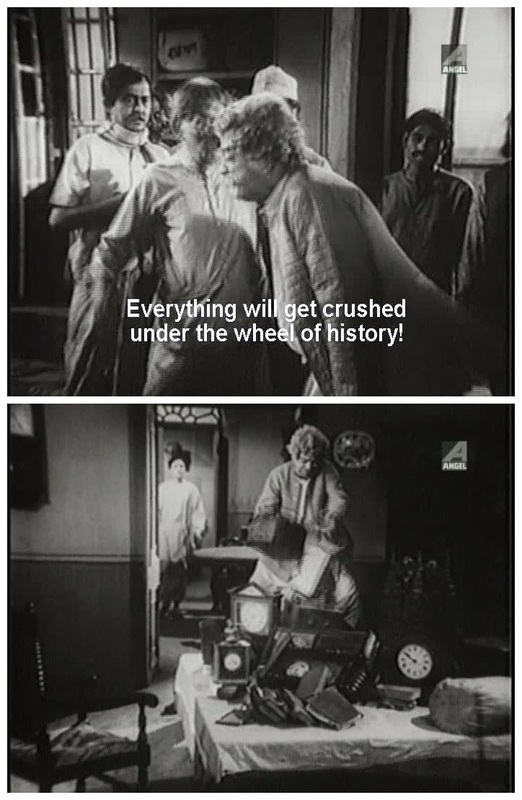 Before I leave Datta entirely, I should note that Samit Bhanja is kind of a jerk in it and Utpal Dutt is in his usual magnificent roaring form. If you've seen this film (or read the novel) and have more substantial thoughts than I do [Editor Self says: not hard], please do leave comments. Yet another Bengali film based on a Bengali novel (by Bibhutibhushan Bandyopadhyay, author of the novels the Apu Trilogy comes from, as well as Ashani Sanket and Baksha Badal)! I really should have made that the theme of this collection of mini-reviews, but I've had a terrible time finding out anything about Pratham Kadam Phool, let alone its source material. Chander Pahar has the most aggressive "this movie is a Big Freaking Deal!" marketing I've noticed yet in Bengali cinema. Whether it actually is a Big Freaking Deal is a matter best discussed by people who know more about contemporary movies than I do, but I like the film very much. (And no, I haven't read the book, which may make a difference.) Set in British East Africa in the early 1900s, the story follows the gleeful adventures of Shankar, a young man from small-town Bengal, who sets out for a job in the Uganda Railways and, at least in the movie, never meets a risk he doesn't love. After facing down several scary animals (the film opens with him running, panicked, from elephants), he joins a Portuguese explorer on a search for diamonds. More dangers, more adventures, lather, rinse, repeat. Across the whole film, the only visuals that make me go "Oh come on now" are of a volcano erupting, and you'd think they could have somehow made use of actual documentary footage of that. Megastar Dev (does he have a nickname?) is the only big-name person in this film, and his character is the POV for most of the observations and emotions. He carries the movie adequately on his ample, lion-battling biceps triceps shoulders. I haven't written about any of Dev's films yet because I haven't made it all the way through more than one, but I like him well enough in small doses, like his frequently WTF Telugu-masala-based song sequences. On a note of #masculinitybengal personal preferences, I have to say that historical clothing + contemporary musculature is a powerful combination. Dev looks much, much better out of his usual eye-scarring mesh shirts, acid-washed denim, spiked hair, and dudebro heroics. Shallowness aside, while I have no expectations of what this beloved-by-generations character should be like, the version of Shankar in this film makes sense if you buy the basic concept that he's absolutely smitten by adventure. All of his choices stem from that passion. He's a brave, generous, likable fellow, and you'd have to be made of stone not to share in his wonder at the situations he finds himself in. It's so nice to see a character who doesn't bewail the suffering and loss that derive from his own decisions. It's also nice for a movie to focus on a type of affection other than romantic or familial and on priorities that invigorate the imagination rather than revolve around revenge, honor, or romance. Shankar is driven by something internal but is as much a man of doing as of thinking (probably more, though without subtitles I shouldn't assume). He's self-reliant and competent at the frequent man vs. beast staredowns yet also very personable on the occasions he has to talk to with other humans. This is not a guy who's out in the wilds because he has no use for society (or society for him). He has run to Africa while still cherishing some of what he left at home. He's made a life-altering choice, and he's in it for the long haul. What I mean to express by all of this listing of traits is that Shankar is a different type of role than mass-y Indian film heroes often play, and Dev handles the combination of action, interaction, and introspection while looking pretty damn good in his safari wear. 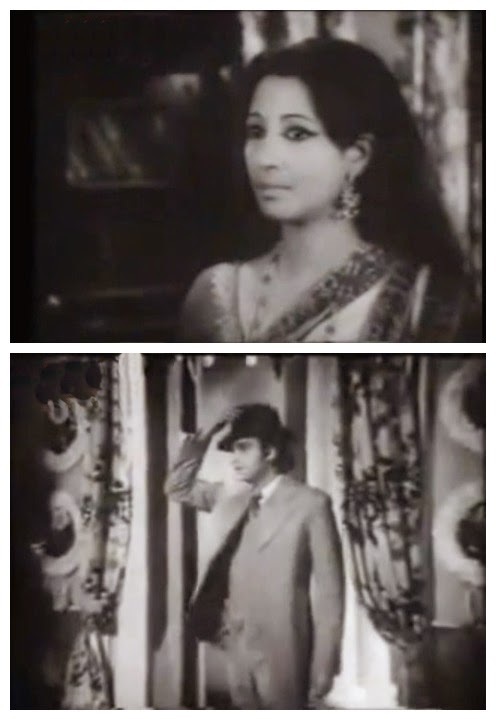 Not Colin Firth levels of wet shirt, but my preferred era of Bengali movies doesn't tend to chuck heroes in lakes. Thank you Beth, for these reviews. I envy your good fortune, and I appreciate your interest in this area. Have not understood anything of the film Saheb bibi gulam (bengali).Uttam Kumar was perfect as if came straight out of the pages of the novel .He is supposed to look and confused.One should write only when they have some knowledge of the novel it is taken from . Sharmila - Of course you're welcome to think that, but I strongly disagree. I think films are complete works in themselves and as such should be able to stand separately from their source materials. What an empty world it would be if we only discussed film adapted from books we've read and understood. What snobbery. Do you only discuss film adaptations of books you've read and claim to understand? Do you investigate all films to confirm whether they're adapted from novels and then scurry out to read the novel before viewing? And perhaps one should comment only when they have some knowledge of punctuation and grammar. No I am not saying that .A film should have its own language even if its taken from an established novel .But the essence of the film is that the character of Bhootnath should look confused and lost as he has not seen anything like this before.The people in the household are completely beyond his imagination and remember he is a new recruit from a village .His innocence and credibility is what makes Bouthan depend on him.And if this character was made quite worldly wise it would lose the basic essence .And there is no snobbery in pointing out the finer points of a novel.A director can make changes but he should keep or adhere to certain things without which the film cannot be understood specially for people who has not read the novel .And in the hindi version Guru Dutt acting has no flaw but he fails to bring out that rawness and simplicity which is the core of the character. Just because somebody is so used to sycophancy that when somebody points out the flaws or better, does not have the same opinion as the KNOW ALL CRITIC the whole world seems to fall down and here is a piece of advice .......only criticise when you can yourself take a criticism.You are not THE ULTIMATE . Wow you're rude. I don't think I'm the best or that I know everything - I very clearly don't know everything, as evidenced by needing to rely on subtitles in films, for example. I face and take criticism fairly regularly, and you are welcome to cross swords with me if you can do so constructively and politely. You criticized my writing but wrote poorly yourself, so I think I am well within bounds to point that out. As someone who comes back to a conversation from months ago to complain about an author on her own site, I really do think you're the sore one. You and I disagree about how adaptations work, and that is fine. We each bring our own mindset to a film (or a novel) and I think a huge range of mindsets can be valid IF they are thought out AND are willing to consider changing. I know mine are, and I will do you the courtesy of assuming yours are as well. But I do not like, and will not put up with, how you talk to me, and I will not clear for publication any future comments from you that continue in this tone. As stated above, I don't tolerate personal attacks.